So here we are, only 2 days away from Halloween and we finally have the kid's costumes all situated and ready to go! Every Halloween, I'm reminded of all the adorable costumes they've worn over the years - from Madison's little owl costume to Austin's 50's Grease costume. Nowadays, it's much more than trick-or-treating for oodles of candy, but really cherishing these precious moments with the kiddos. Moving into Halloween, decorating with pumpkins a couple of weeks before Halloween may seem a little late for some. Having the decor last through Thanksgiving is always nice, since you don't have to make too many changes from holiday to the next. I used to make Halloween decor more festive with fun bats and crafty pumpkin garlands, but I wanted something more universal to fit both holidays (Halloween & Thanksgiving) in my modern vintage home. As a DIY project last year, I took these craft pumpkins and painted them in vintage white using acrylic paint. Martha Stewart gold leaf stickers and decorative adhesive trim from Michael's Craft Store was then used to embellish a few of these cuties. It's such an inexpensive way to dress up your pumpkin decor and it cost less than $20 to achieve this whole look. As you can tell, our living room is currently surrounded with wood panel walls, a feature of older Texas homes. I do appreciate the wainscoting detail, so the goal is to just give it a cosmetic makeover with white paint. If anyone can shed some light on how easy or difficult this task might be, I'd love to hear your thoughts. 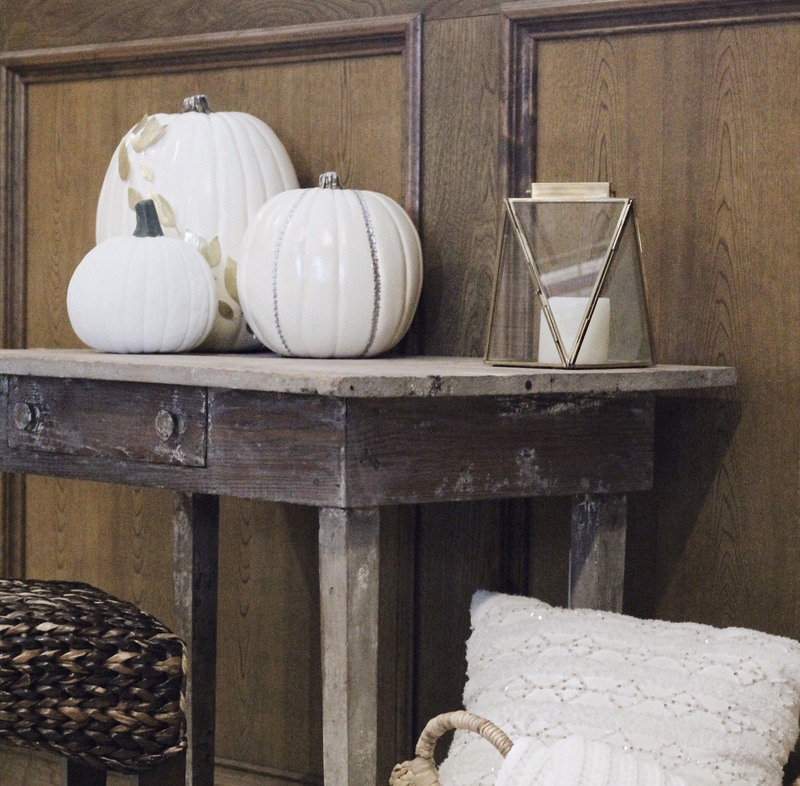 In the meantime, these white pumpkins will be exactly what's needed to lighten up the room. I was smitten over these fairy tale pumpkins from our recent visit to the pumpkin patch last weekend! 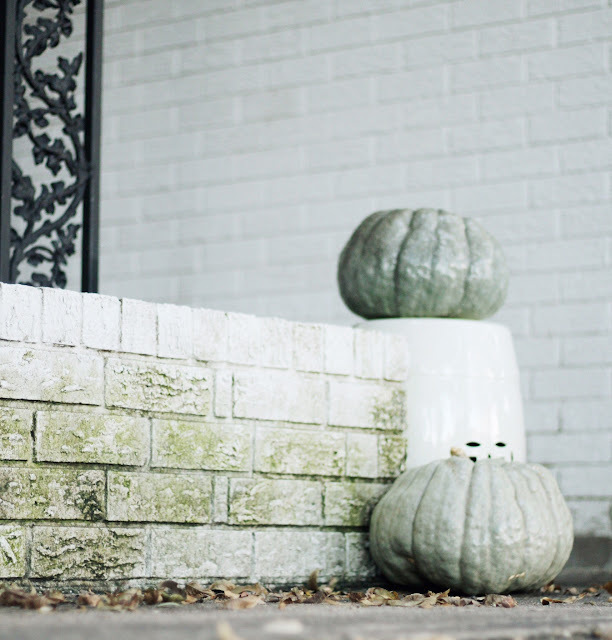 The sage green hue provides a garden like feel, which is why these dreamy pumpkins are in the living & dining room, as well as in the main entry way of our home. Rainy days this month has caused algae to start forming along the brick flower bed, but it pleasantly adds character to this pumpkin display. 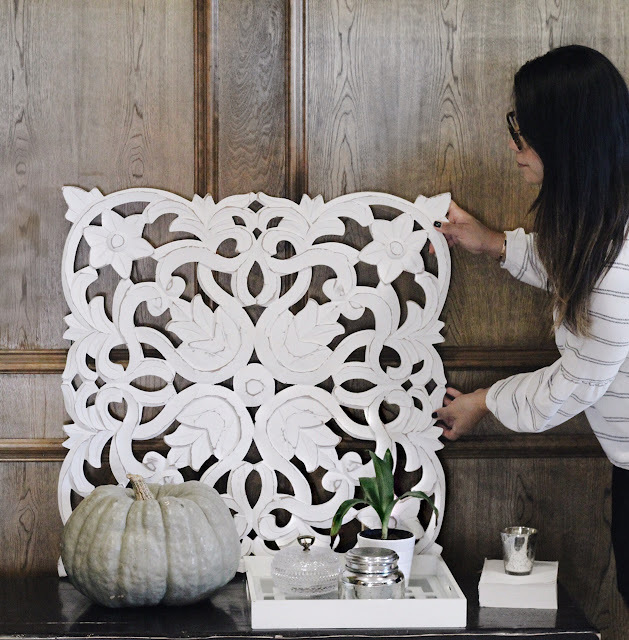 Aside from adding a few more details, such as a couple of beautiful Fall floral arrangements, this will complete this simply pretty look. It's not too late to start decorating with pumpkins, so get creative and have fun adorning your space during this festive season. Have a safe and fun filled Halloween lovelies! Chat with you soon! 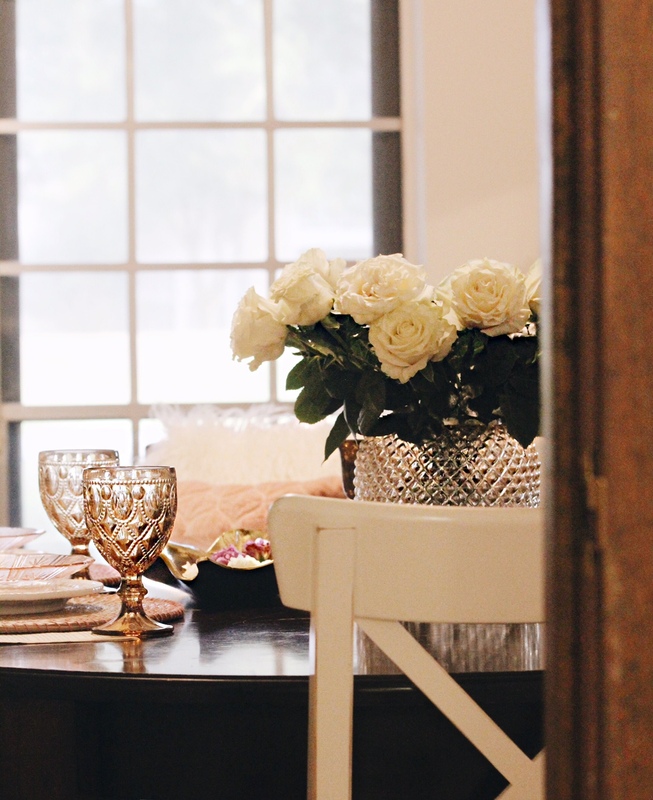 From the moment I started planning my wedding (a couple of years ago), I knew that my love for blush wasn't going to end at wedding decor. This sophisticated and grown up version of pink, has really become part of my line up of neutrals. It's a more feminine alternative to your beige and tan shades and blush effortlessly creates a look that's romantic and ethereal. It was love at first sight with this french quarter pullover from Madewell because of it's rosy blush tone. 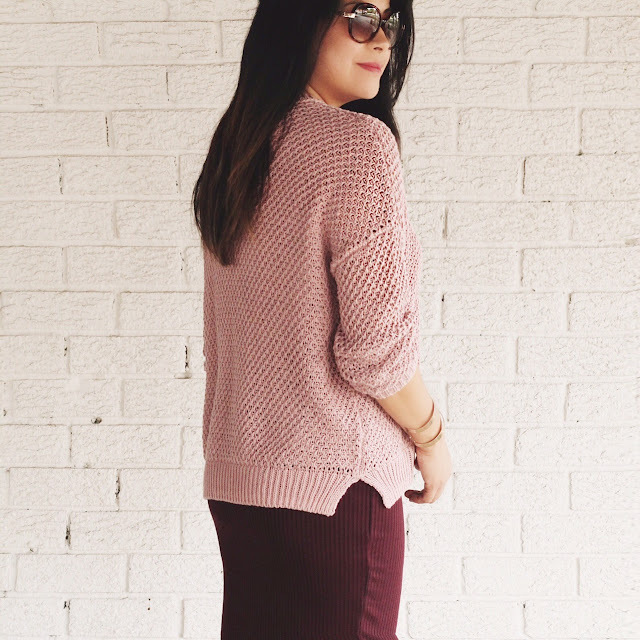 This over-sized pullover was the perfect match with this cranberry pencil skirt from Nordstrom Rack. With chunkier sweaters, I usually like pairing them with pencil skirts most of the time. The casual relaxed volume of something over-sized, with the slimming effect of the skirt accentuates your figure in just the right areas. This sweater is on sale at Madewell and I highly recommend it! 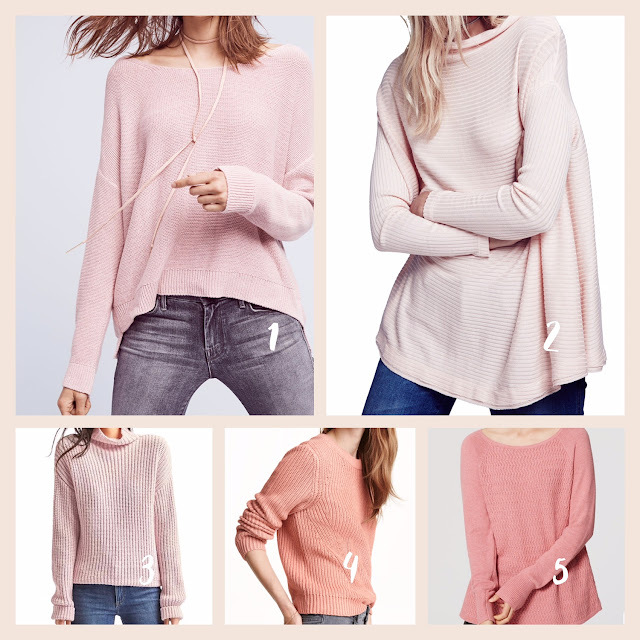 Here are some other pretty blush toned sweater options, all under $100. 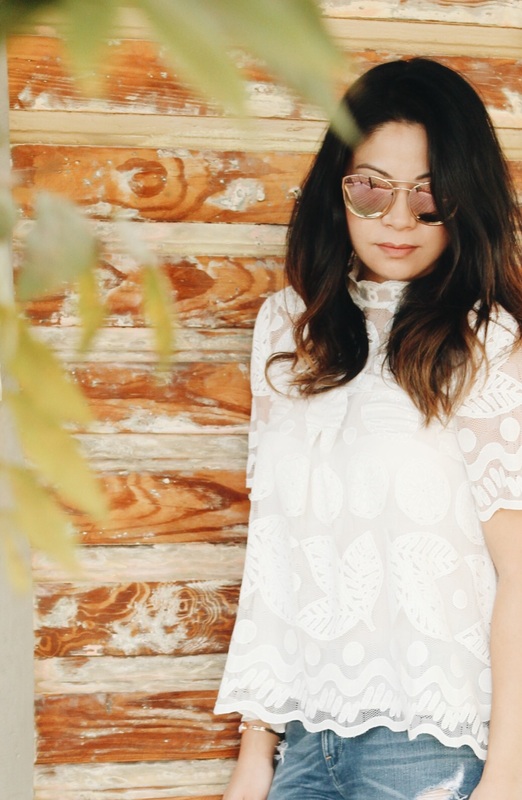 Everyone needs a blush shade in their wardrobe and I promise, you'll be glad you did. You'll find that blush happily goes with all your basic colors of denim, white, grey, black, and beige. Have a beautiful day friends! Plaid will always be one of my favorite prints and it's hands down a staple item in my wardrobe! It's classic, timeless, yet on trend at the same time. I'm sure we all have at least one plaid item we love and go to often; and for good reason. Prints can be hard to wear at times, but plaid is an "all-around" print that's effortless and doesn't require much work to look it's best! 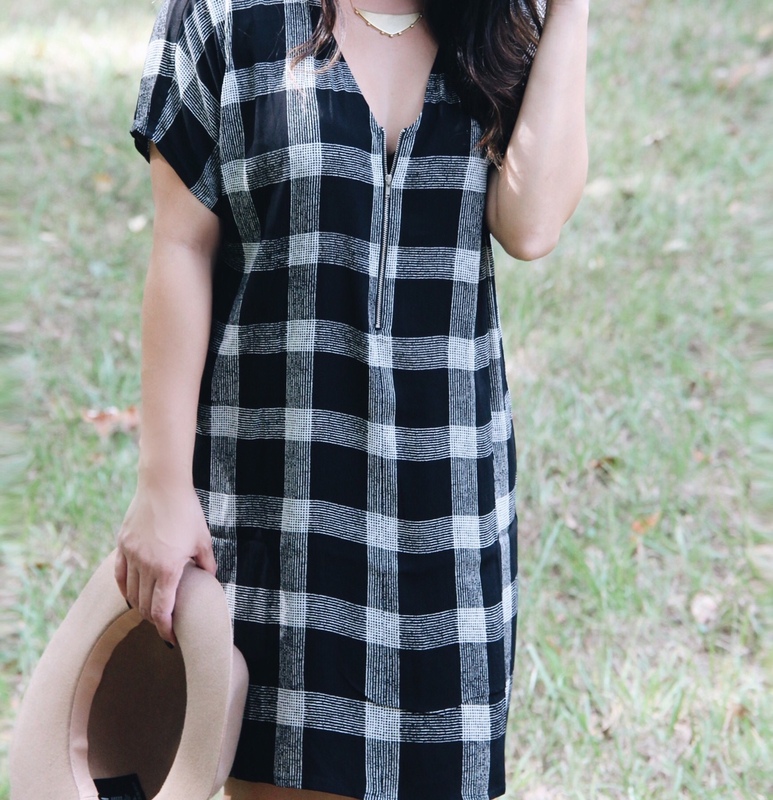 On a quick run to Madewell over the weekend, I came across this black & white plaid dress and knew I had to have it! The v-neckline with the adjustable front zipper is what I'm loving most. 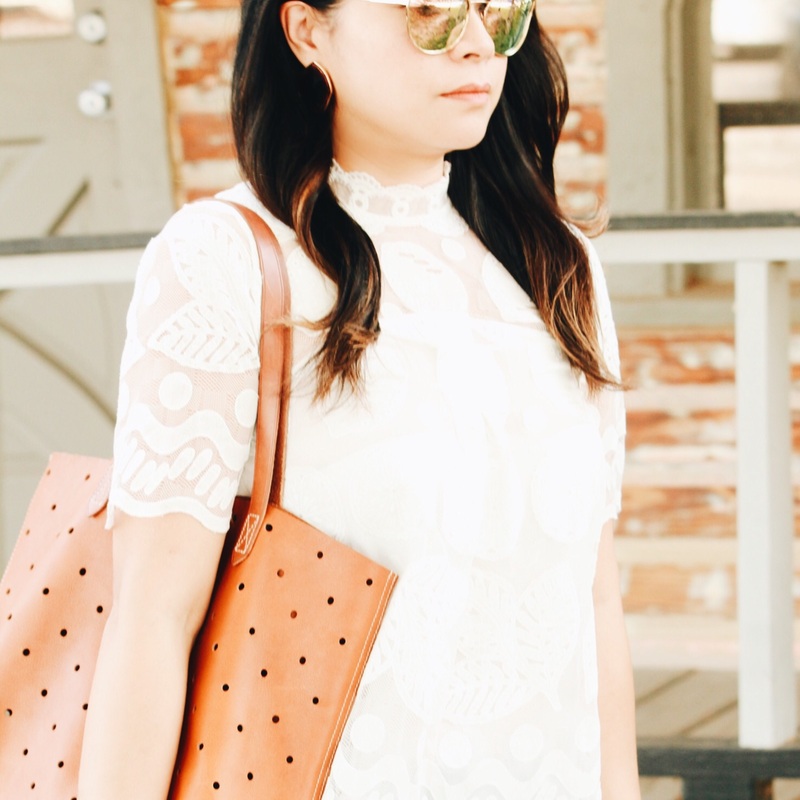 It adds a pop of modern flirtiness to this tunic style silhouette. 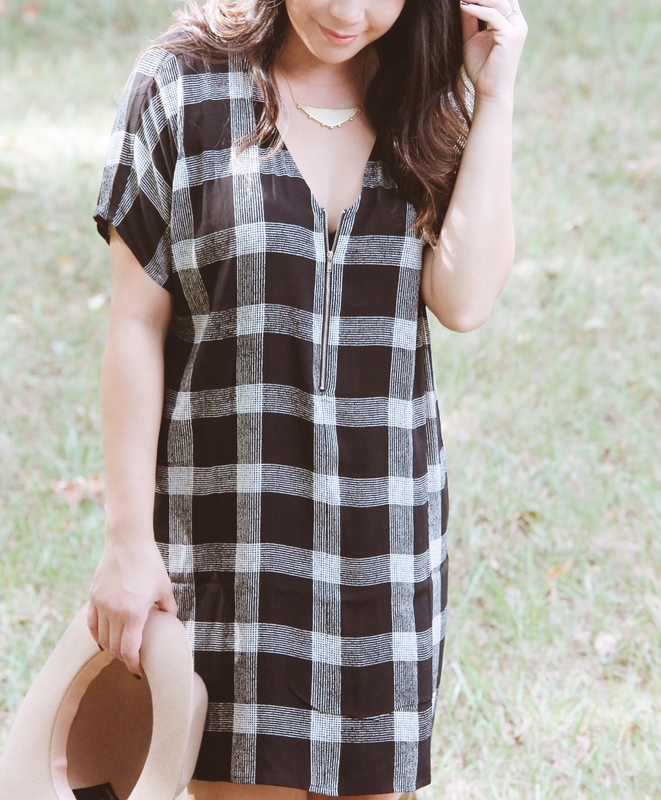 Tunic dresses are truly your best friend while waiting for the colder temps to start kicking in. You can still sport some fall flare, without having to wear your favorite turtleneck just yet. You can always add an over-sized cardigan or denim jacket tied around your waist to change up the look. Both would work perfectly with fall booties! Not to mention, this is one of those dresses that looks fabulous paired with a wool hat. This zipper front dress is currently available at Madewell stores & online, as part of their early November collection. There's no question that Autumn is the best time of the year for decorating! 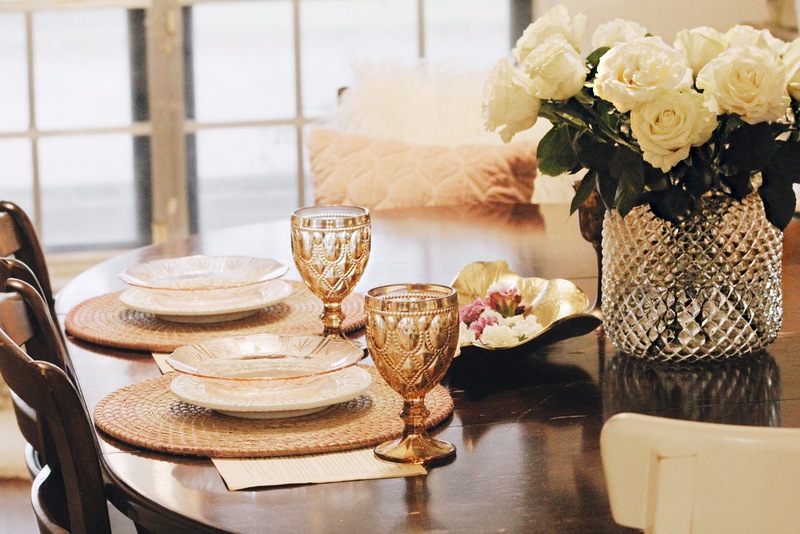 It's the perfect opportunity to incorporate colors that you typically wouldn't use during the rest of the year - like shades of orange, yellow, and deep jewel tones. Personally, I like to keep things neutral in the house, but I was eager to create a romantic look of autumn colors. 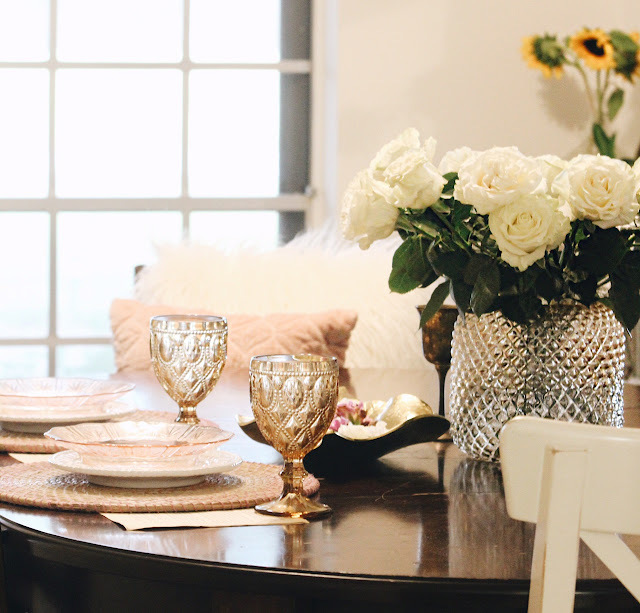 It's all about texture when I decorate, which is what I'm most known for. I love playing with dimension through textural pieces, as it livens up a space in such a beautiful way. 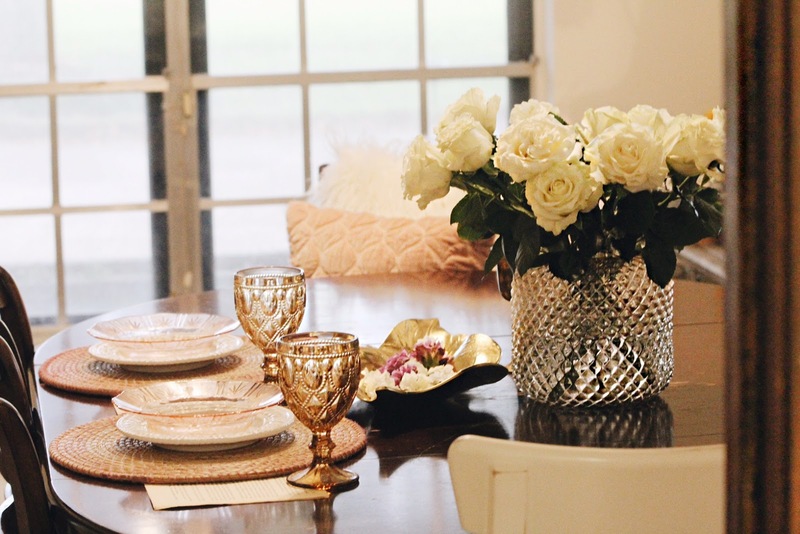 When creating this centerpiece, I wanted to use this large candle holder that I picked up at a recent visit to Marshall's. The diamond detail is gorgeous and I love how the Amber hued glass reflects light when the sun gleams in. All I needed to do was remove the candle insert before adding a dozen of billowy white roses. Style Tip: When creating a floral arrangement, I like to cut the flowers at 3 different lengths for added dimension. Separate the flowers into three groups of four. Take the first set of 4 flowers and cut the stems to the desired height of your floral display. Then take another 4 flowers and cut these approximately 1 - 2 inches shorter than the first batch. Add these flowers to the vase, alternating between the tall and shorter stems. The last batch of flowers will be used to fill in any gaps. Cut each remaining stem accordingly to see what height works best to fill in any open space. Having your flowers at different lengths gives the appearance of a much fuller floral arrangement. 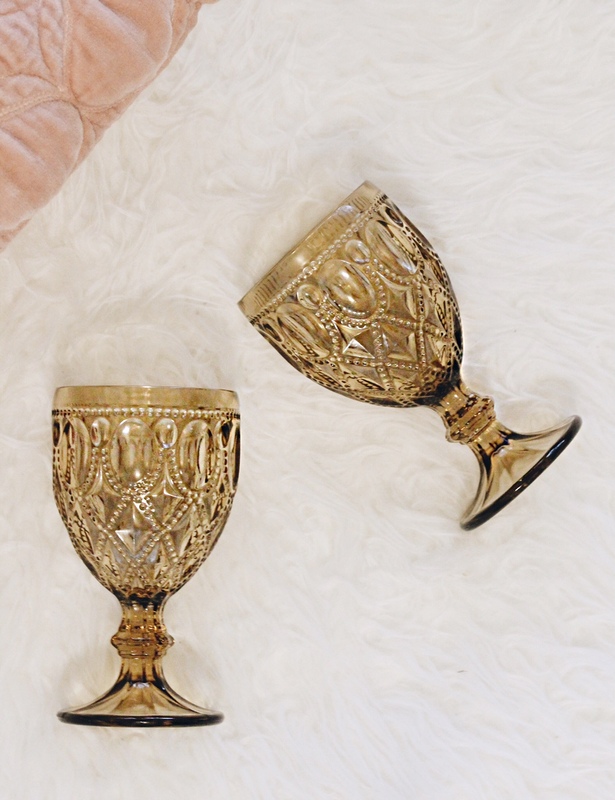 These dark amber goblets dressed up this table setting elegantly with their unique patterned design. For a bit more glam, I added these pretty pillows at the head table. 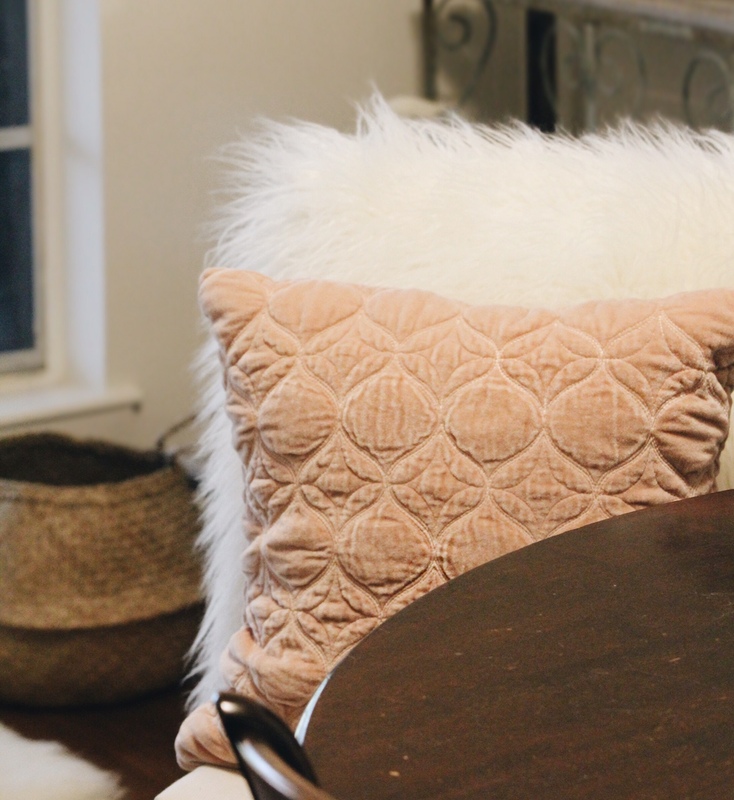 With velvet being a current trend in interior design, I knew this blush pillow would be the perfect fit. Doesn't the quilting remind you of Juliet's dress in Romeo + Juliet? To transition into a more festive look, I can always add a few small fairy tale pumpkins to the table, which is the beauty about decorating. As you gain more inspiration, you can just add as you go. Many times it's easier to work with a few decor pieces initially and then add more where you see fit. This keeps you from over decorating and purchasing too many items that you may not need after all. 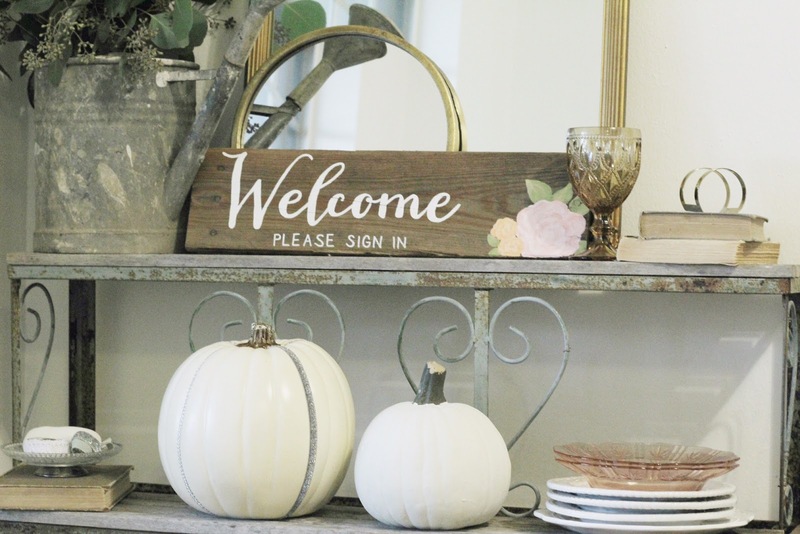 I'd love to hear about how you've been decorating for the Autumn season. Please do tell! Have a great weekend ahead and I can't wait to chat with you again! Houston has a lot of beautiful architecture, but this one took the cake for me! Once a pottery/ceramic studio that we hosted my daughter's birthday at, I came across a now empty home in the midst of a renovation. I absolutely fell in love with the rusticity of the exposed woodwork and the beautifully rusted metal roof. It's not often where you take away the old to reveal something truly extraordinary! 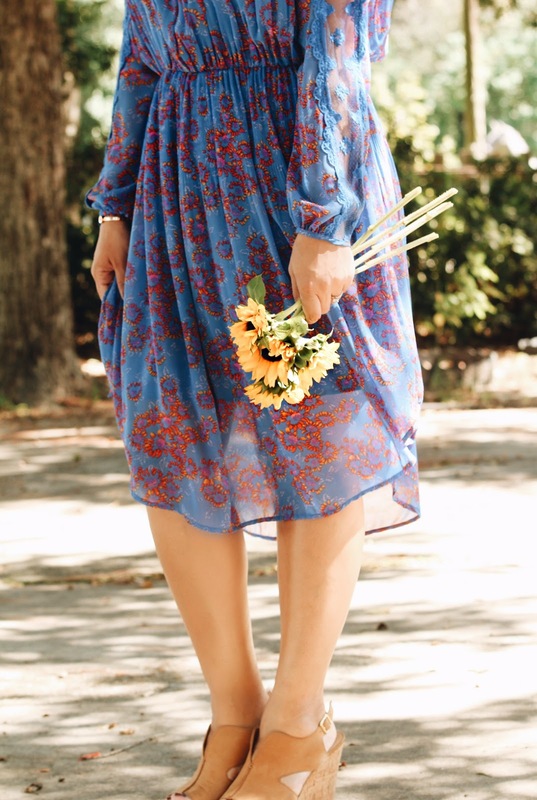 I knew I had to take photos with this vintage gem and it ended up being the star of the shoot! Anthropologie does it best when it comes to their lace patterns and I couldn't pass up this lemons + leaf white top. No detail was left unturned with this playful motif of lemons, leaves, and polka dots. Pretty scalloping adorns throughout with a button closure in the back. It's such a pretty top, that your look is instantly dressed up with a cute pair of patchwork jeans or whatever you fancy. Here we are in the second week of October and I must say, this is turning out to be an exciting month! Last week, my sister Marcia came to visit for a few days and we had such an amazing time together. We went shopping at our favorite stores, did each other's makeup, tried new foods, and even went cycling. It was my first time cycling (my sister's 1 millionth time), and I loved it! If you're in the Houston area, Soul Cycle in Memorial is a place I highly recommend and your first ride is free. A few days later, my mom arrived and it was an absolute joy to see her! To celebrate, we decided to invite my hubby's family over for brunch today. We were hosting a fiesta themed brunch and to get in the spirit of things, I searched my wardrobe for a festive dress. 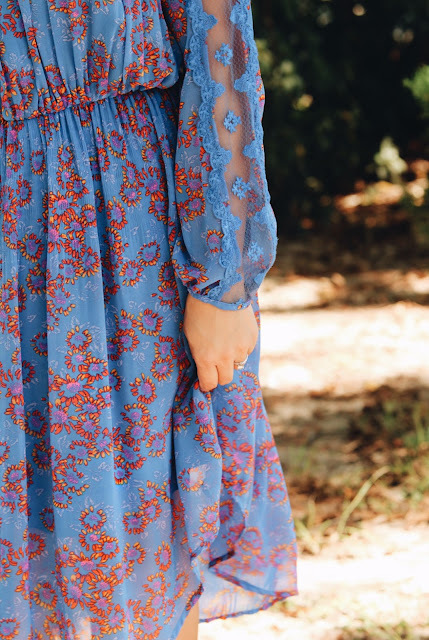 The vibrant colors and the pretty lace detail on the sleeves grabbed my attention and I thought it was a perfect fit. This was a purchase from Free People a few months back, but they have a gorgeous selection of floral dresses, lovely for brunch, date nights or special occasions. I have linked a few below and I hope you like them! Time with family is so precious and I try to enjoy every minute of it. Life may put us in places we never imagined, but I have grown to love my new home. It's where my kids were born and where I got married. I'm very thankful that we have the opportunity to spend quality time together throughout the year, whether it's flying to California, Texas, or good ole' Las Vegas (another family trip hot spot of ours). I hope you all have a wonderful and blessed week and I'll chat with you again soon! 1. Loft Striped Lace Top: The floral lace detail of this top is so beautiful and romantic, that compliments will be flying your way - left and right. This will be perfect paired with your favorite distressed black jeans for that grundgy chic look. The best part is... it's 40% off with code: FallFest. 2. H&M Faux Suede Coat: Suede is making a huge presence this season and I'm all for it! 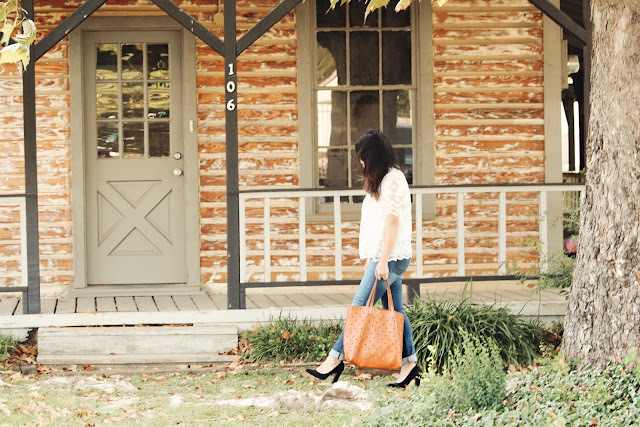 I love the neutral camel shade, which will look fabulous with all things denim. It's currently at an amazing price and I suggest that you grab this one quickly before they're all gone! 3. Sole Society Freja Sandal: I've been obsessed with the criss-cross shoe trend and I have a similar pair in chestnut that I wear religiously. These black lace up sandals from Sole Society is a must have and you'll find that this style works so well with nearly all your outfits. Be sure to sign up for their mailing list to get 15% off your first purchase of $80 or more. 4. Madewell Ex-Boyfriend Plaid Flannel: I really love the colors of dusty rose and fig in this flannel shirt; it's so pretty and feminine. 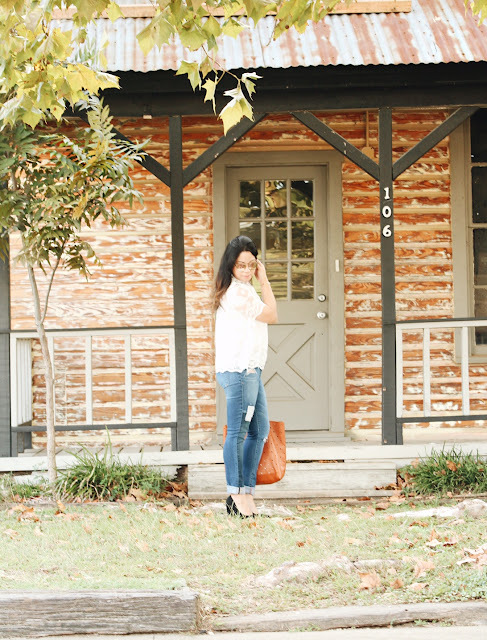 Madewell shirts last forever and you'll surely take this one out year after year. 5. Anthropologie Juliol Euro Shams: I'm that gal who loves an "all shades of white" bed. To add more dimension to an all white bed, shams are a great place to do it. These Euro shams will be absolutely perfect with it's textural seaming and the blue bohemian border. 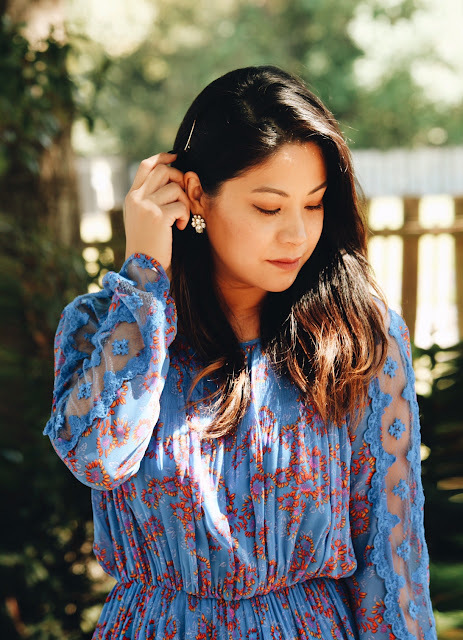 Anthropologie is offering an additional 40% off all their sale items, so pick this up fast in the euro or standard size. Have a fantastic and fun-fulled Columbus Day weekend lovelies! If you're looking for the perfect cardigan alternative, this lightweight parka fits the bill! This has been my "grab and go" piece lately and I've been taking it with me everywhere; feeling and looking put together. I really like the drawstring detail because it cinches you in at the waist, giving you that hourglass figure. There is an over-sized hood that drapes nicely and I can see this being a lifesaver for those breezy days. This parka comes in Dark Green, Black, and Rust (rose gold) - all great neutral options. 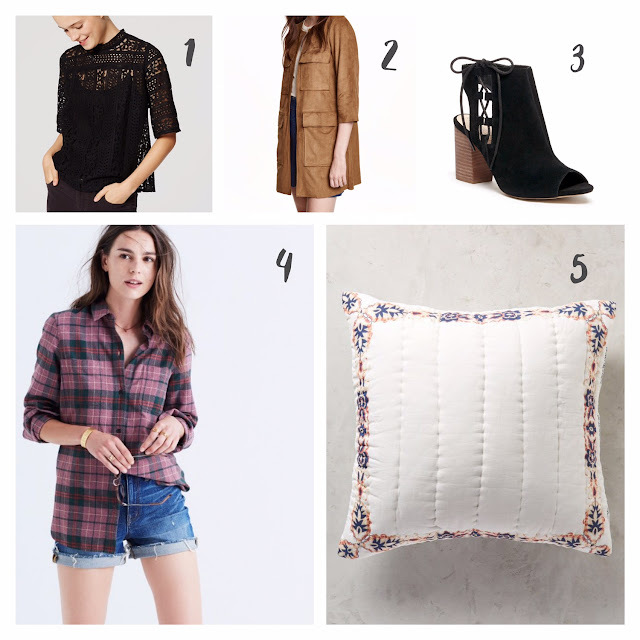 Suede is also another trend you'll be seeing more this Fall. I picked up these Taupe suede booties from Nordstrom last year and they will definitely be in constant rotation this season. As another style option, I like to wear this outfit with a cute pair of Stan Smith Adidas kicks. I have already seen Columbus Day sales around and be sure to scope out all your favorite places for amazing deals on new arrivals. I will be posting some of the items I'll be checking out this 3 day weekend, so please stay tuned to see my picks. Thanks for staying awhile and have a great rest of your day!